Ruta Maya open mic hosts featured poets, Bill Shute and Michael Aaron Casares for a night of verse and open mic. 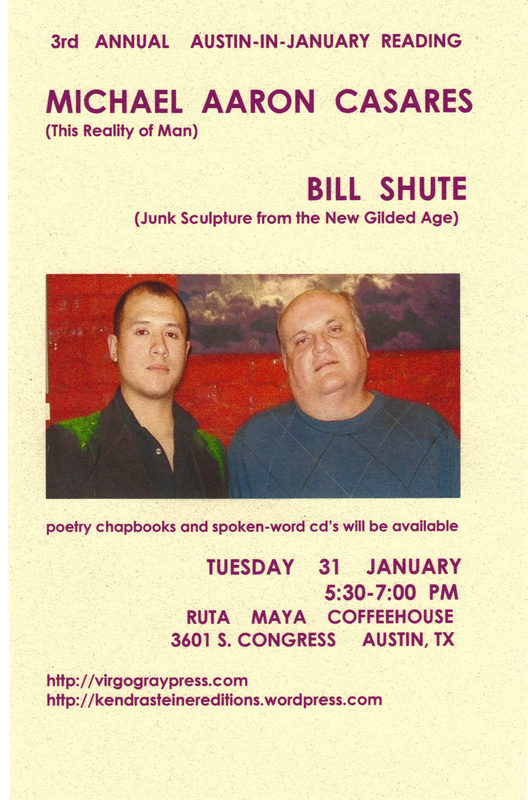 Bill Shute, a poet and publisher from San Antonio, returns for his third annual Austin reading w/ Michael, this time featuring his collection “Junk Sculpture From The New Gilded Age”. Austin poet Michael Aaron Casares (formerly of San Antonio) shares poetry from his new book “This Reality of Man” and more! Open Mic precedes and follows! Free and open to the public!